Songs of love, grief, joy and humour arranged by Elinor Bennett. The harp is the national instrument of Wales and has enjoyed an uninterrupted history, spanning over one thousand years. The Welsh King Hywel Dda (Hywel the Good) codified Welsh Law in the 10th century, laying down clear priviledges and duties for harpists and bards in the court of Welsh nobility, and showing the high regard in which poets and musicians were held. We will depart on a musical journey to trace some of the most important elements of the traditional music of Wales, starting with excerpts of mediaeval Welsh bardic music which had been passed from master to disciple for many centuries as part of the oral tradition. Harpist Robert ap Huw (1580- 1665) wrote his collection of bardic music, “Musica”, in c.1613, realising that the old bardic tradition was being forgotten and replaced by a new fashion in music. Written in a unique and ambiguous tablature, the manuscript is kept at the British Museum, London. 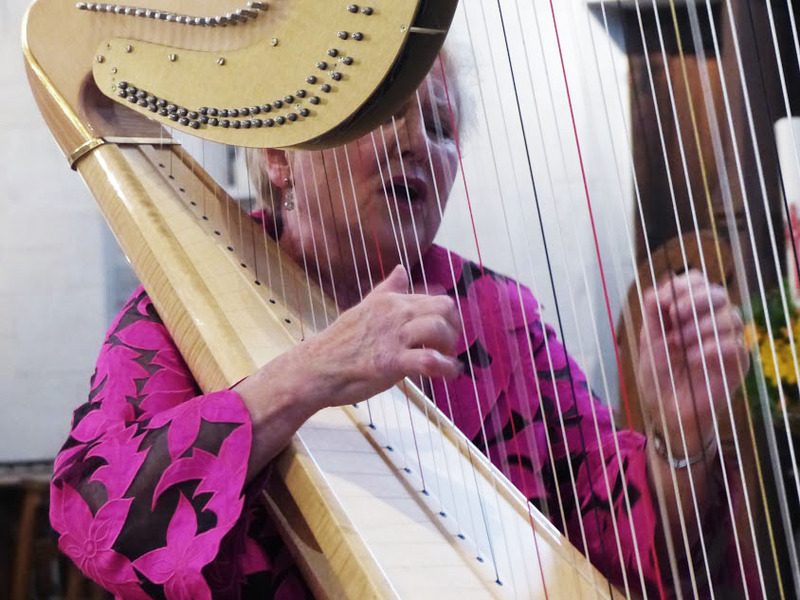 The Triple harp (Arpa Doppia, or Arpa a Tre Registri) has three rows of strings, and was invented in Italy during the late 17th century, to give harpists more strings on their instruments to play the new music of composers such as Monteverdi and Trabaci. The most famous of 18th century Welsh harpists was John Parry, known as “Blind Parry of Ruabon”. He was domestic harpist to Sir Watkin Williams Wynne of Ruabon in North Wales - a patron of art and music in the 18th century. Edward Jones’ first triple harp was made by his father in the little village of Llandderfel in North Wales. As a young man, he won an important competition and went to work as harpist in London, becoming known as “The King’s Bard. Cerdd Dant is a traditional form of singing that is unique to Wales. The art of combining poetry with music in some form of declamatory style is an integral part of Welsh culture. The modern form of Cerdd Dant also called Canu penillion (lit. the singing of verses), has evolved from the folk culture of the 18th century and usually involves a harpist who plays a melody or traditional “air” on the harp while a singer who sings a counter melody that must fit - harmonically and in poetic metre - with the melody played on the harp. In this case, the harpist and singer will be one! The celebrated nineteenth century harpist / composer John Thomas (who earned the title of “The Chief Musician of Wales”) arranged and published his collection of 24 Welsh Melodies for solo harp in 1861.